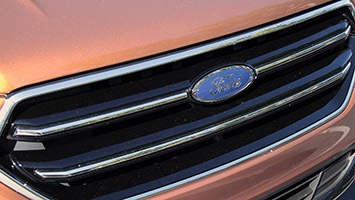 The Ford Escape debuted in 2001 when the US market offered a single-digit number of small crossovers. The Toyota RAV4 was five years old, the Honda CR-V was four, the Subaru Forester was just three. 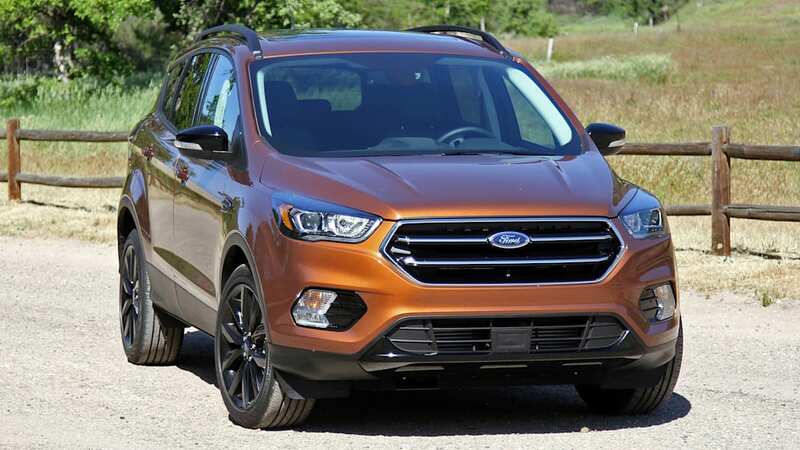 As the crossover models proliferated and SUVs took over a third of the US market, the Escape remained at or near the top of the sales leaderboard: as recently as 2013 the Escape outsold the RAV4 and CR-V. In 2014, however, the CR-V claimed top sales and dropped the Escape to second place. In 2015, both the RAV4 and the CR-V bested the Escape in sales. Despite the demotion, the runt in The Blue Oval's crossover litter remains a success for the brand. 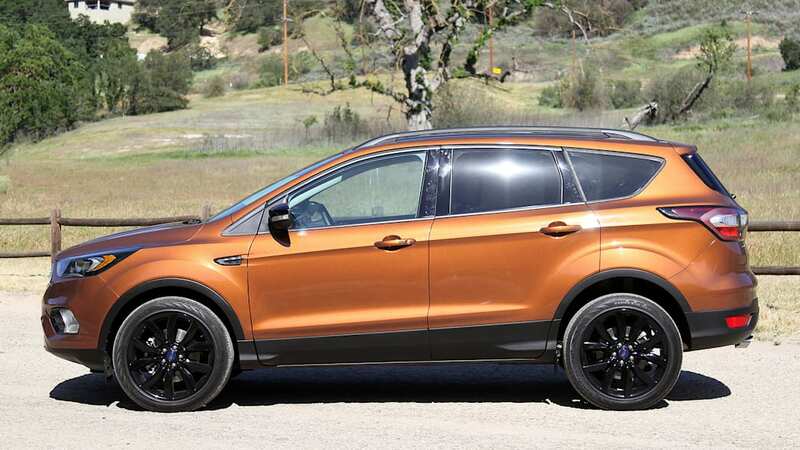 Ford said millennials and Baby Boomers are the two largest demographics for compact crossovers, and those two buying groups helped Ford sell 306,492 Escapes in 2015. 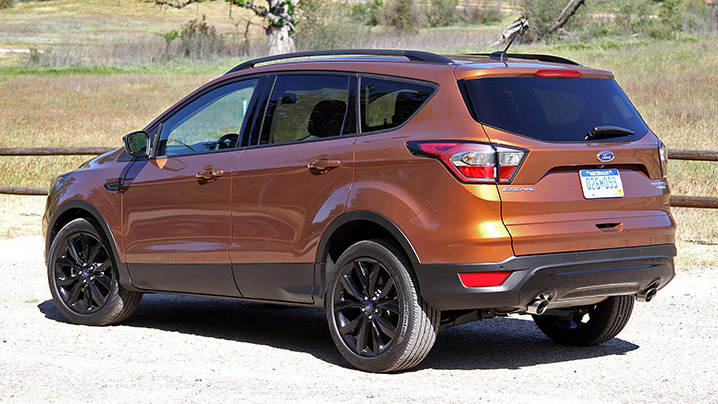 The sales tally marked seven straight years of increases and made the Escape the best-selling Ford behind the F-150. 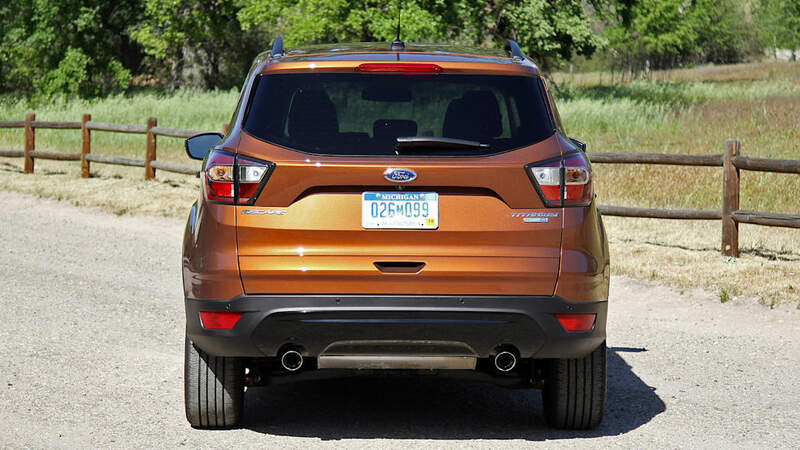 Ford also says the Escape is the number one nameplate for female buyers out of all Ford models. Nevertheless, the Dearborn carmaker wants its sales crown back. 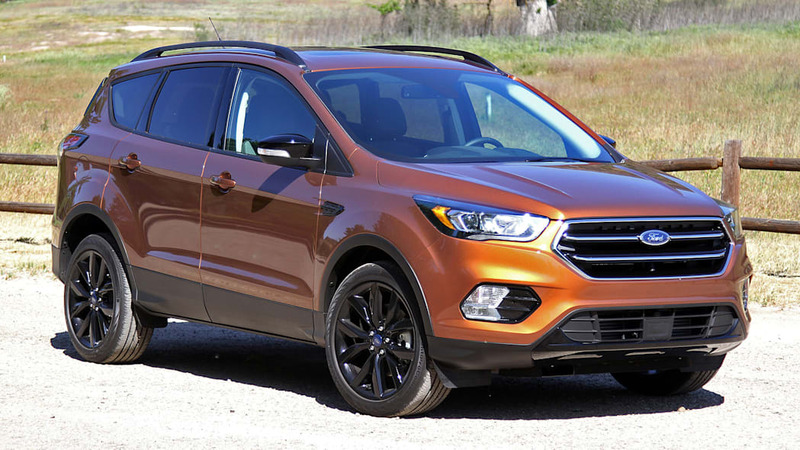 The heavily refreshed 2017 Escape is Ford's attack on the throne. The heavily refreshed 2017 Escape is Ford's attack on the throne. Outside, designers reworked everything ahead of the A-pillar and tweaked the tailgate area. A new aluminum hood saves weight. The front fascia adopts Ford's corporate design language of horizontal lines highlighting a hexagonal grille. The Titanium trim we drove gets new halogen projectors standard that can be upgraded to HID units. The tailgate features sharper creases and the taillights are now all-LED units. The redesign is mature in the best sense – still recognizably an Escape minus the aggression when viewed head-on. The optional Sport Appearance Package substitutes glossy Ebony black for the normal glossy silver brightwork on the upper and lower grilles, window surrounds, side mirror caps, headlight and taillight bezels, roof rack, and rear fascia. The package also fits 19-inch Ebony black wheels wearing 235/45 Continental ContactPro tires. Our test vehicle's Canyon Ridge color is one of three new exterior hues, along with White Gold and Lightning Blue. 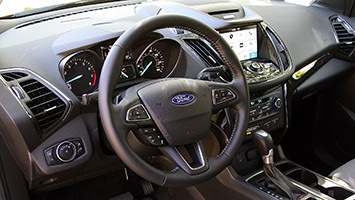 Ford invested much more of its refresh budget on the inside. Said Escape program manager Chris Mazur, "Pretty much everything the customer touches, we touched." 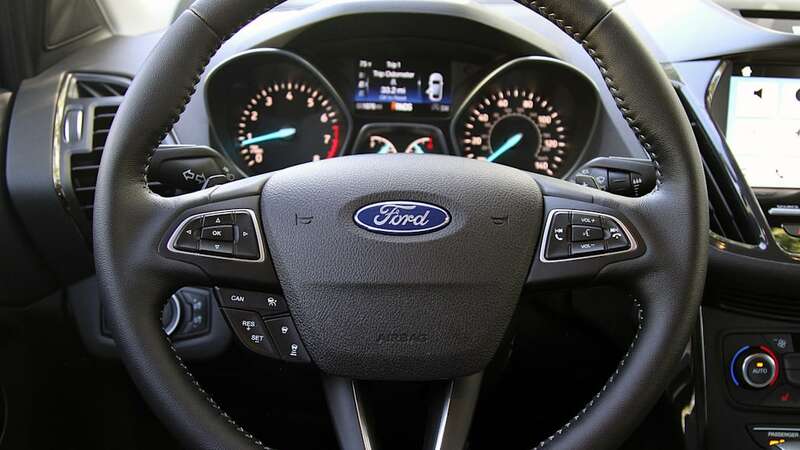 The helm features a new three-spoke steering wheel with larger five-way buttons. Ticking the box for the Sport Package upgrades to a leather-wrapped wheel with white cross-stitching, a leather-wrapped shifter, and patterned cloth sport seats with leather and vinyl bolsters. Finer-grained vinyl or nicer leather tops the new instrument panel. Darker plastic and piano black trim pieces banish the previous model's 50-shades-of-gray palette. It looks and feels nicer everywhere. The new shape of the one-piece outboard vents channels more air into the cabin. Installing a new electric parking brake and moving some optional controls to the climate-control panel frees up room for three storage cubbies around the cupholder. The USB jack in the forward cubby charges devices twice as fast. A larger armrest cover hides a dual-level pocket; pull the left lever on the clamshell top to access a shallow tray, pull the right lever to access the massive six-liter pocket that's 50 percent larger than before. The Escape introduces SYNC 3 Connect to the Ford range. Using the FordPass app enabled by a 4G modem inside the crossover, an owner can remotely start the vehicle, lock and unlock the doors, and monitor tire pressures and the fuel level. That modem also means over-the-air updates to SYNC 3, so no more carrying USB drives between your computer and the car. Sync Connect comes standard on the Titanium trim, or as part of the optional Technology Package on the SE model, with a five-year free subscription in both cases. 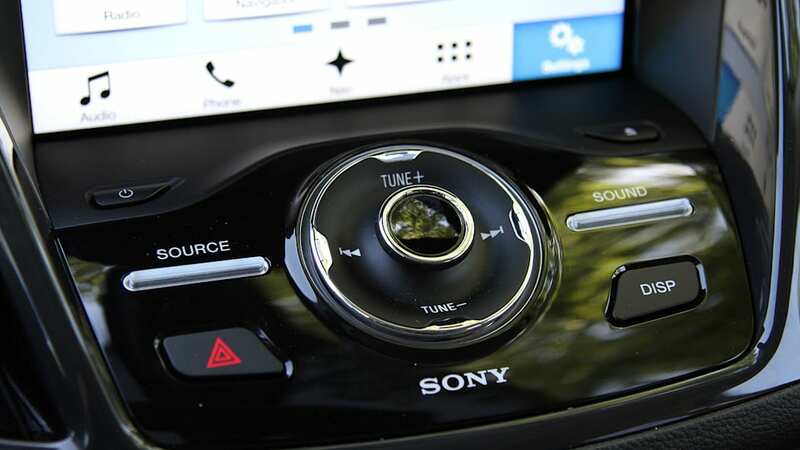 The other big infotainment additions: both Apple CarPlay and Android Auto. Ford didn't enable a Wi-Fi hotspot, sadly. 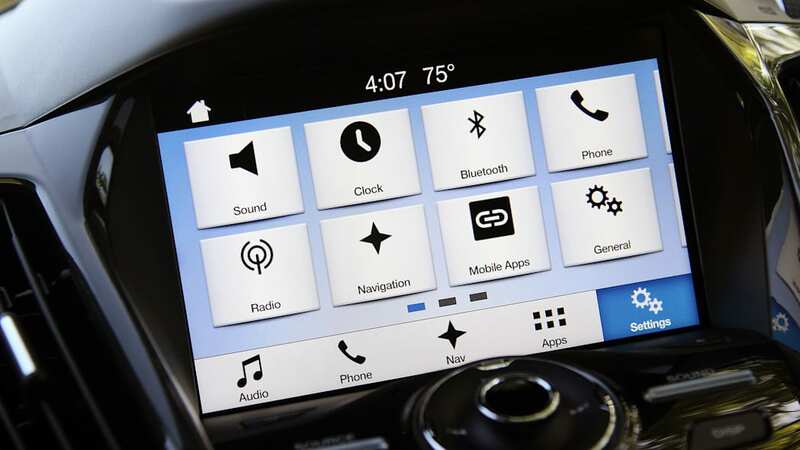 Driver-assistance systems migrate from the Escape's larger brothers and come with adjustability that you normally only find on premium or luxury cars. The $595 adaptive cruise control with pre-collision assist includes three driver-selectable following distances. 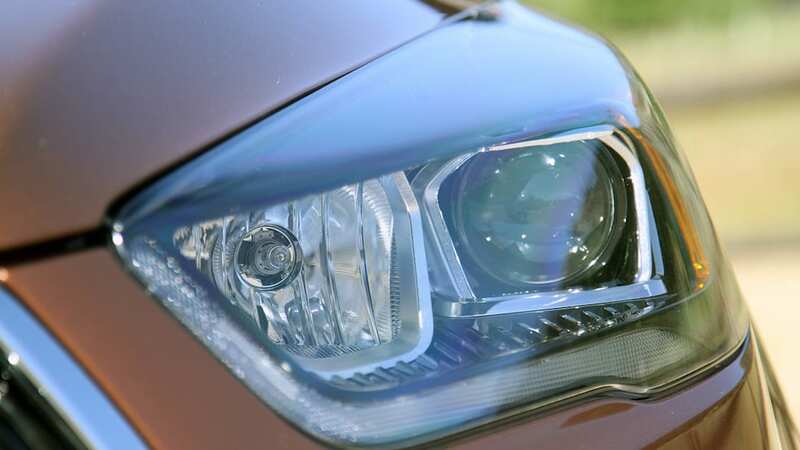 The $1,995 Equipment Group 301A bundles Enhanced Active Park Assist, a lane-keeping system, and a driver attention alert with HID headlights, a heated steering wheel, and rain-sensing wipers. The parking system slots the Escape into and extracts it from parallel and perpendicular spots, with the driver responsible only for shifting gears and working the pedals. The variable lane-keeping-system alerts include a chime, steering-wheel vibration, and gently turning of the wheel to guide the Escape back into its lane. A driver can choose which alert or alerts she or he prefers and adjust their intensity. Mazur told us that buyers choose the Escape for the range of engines and sporty ride. On the engine side, the base S trim sticks with the naturally aspirated 2.5-liter four-cylinder with 168 horsepower and 170 pound-feet of torque. Only ten percent of buyers choose the base model, which Ford considers the fleet option. 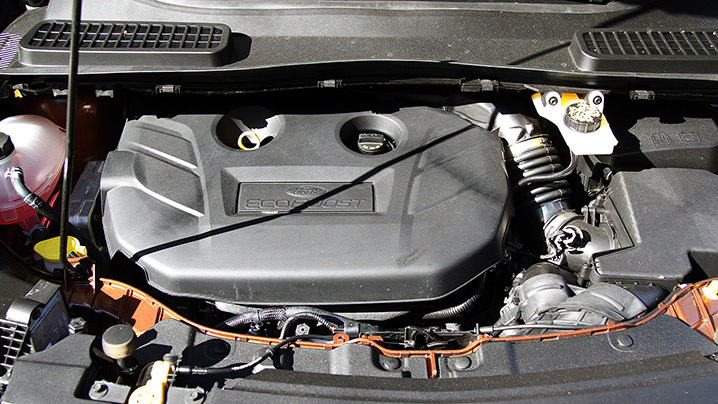 The standard motor on the SE trim is the 1.5-liter EcoBoost four-cylinder shared with the Ford Fusion, here developing 179 hp and 186 lb-ft. That's six horsepower and two more pound-feet than the former mid-grade Escape engine, a 1.6-liter EcoBoost. On the steep canyon roads of our test route both engines pulled vigorously and without any hint of turbo lag. 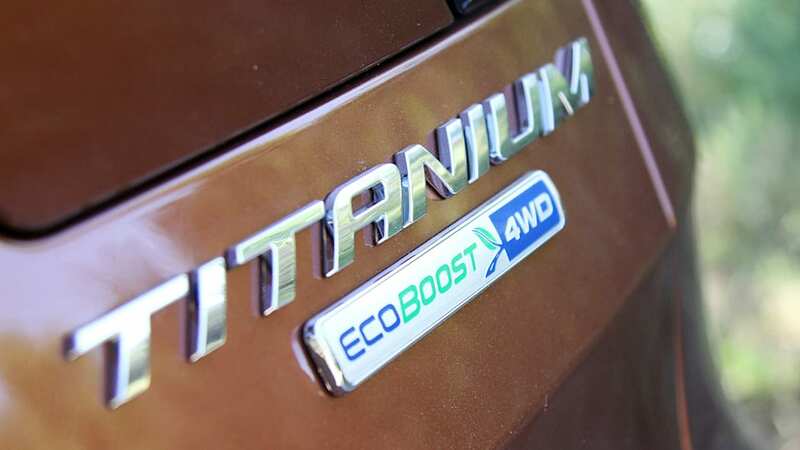 The Titanium trim comes standard with a heavily revised 2.0-liter EcoBoost with a twin-scroll turbo, the same as the engine in the Ford Edge, and is an option on the SE. It puts out 245 hp and 275 lb-ft on 93 octane, five more horsepower and pound-feet than the old 2.0-liter EcoBoost. 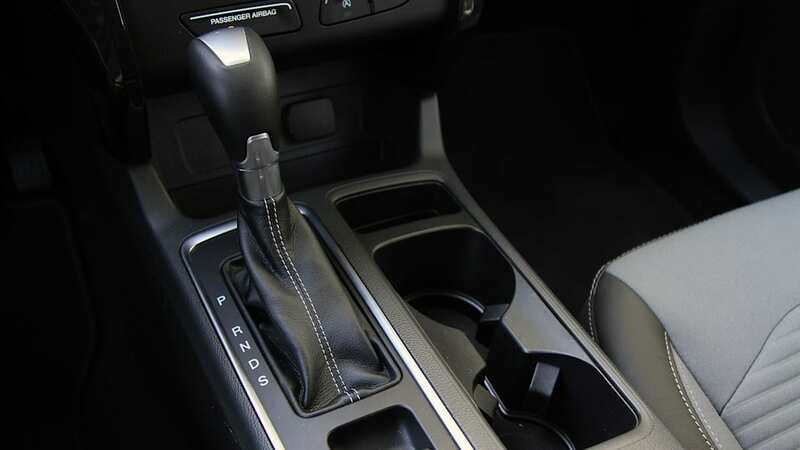 The sole transmission is a six-speed automatic, controllable through paddle shifters on the SE and Titanium trims. Both the 1.5-liter and 2.0-liter EcoBoost engines get auto stop-start technology, said to improve fuel economy by up to six percent. Even so, highway mileage takes a minor hit, the 1.5-liter getting 30 highway mpg compared to 32 with the previous 1.6-liter. The 2.0-liter, a new addition to the engine range, is rated at 22 mpg city, 29 highway, and 25 combined. On the steep canyon roads of our test route both engines pulled vigorously and without any hint of turbo lag. Both four-cylinders make a fair bit of noise when stressed, though the harder-working 1.5-liter is understandably louder than the 2.0-liter. Even though the 1.5-liter gives up 66 hp and 89 lb-ft to the 2.0, the smaller EcoBoost doesn't feel like the cheap choice. 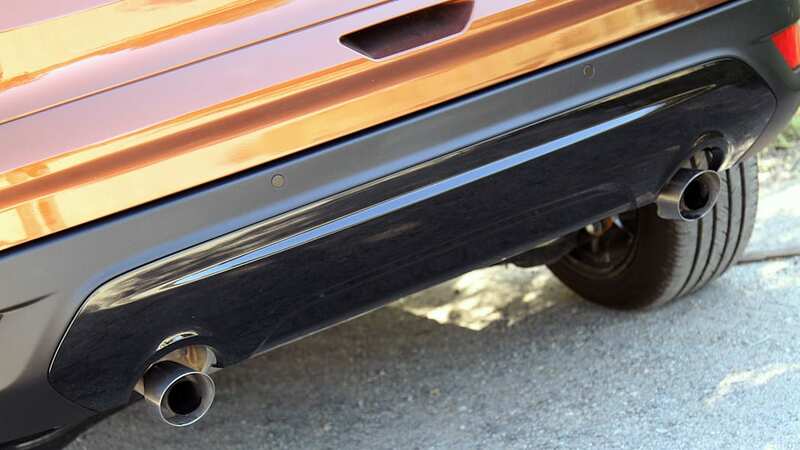 Additional sound deadening like acoustic side glass, batting in the wheel wells and front doors, and a 360-degree seal around the hood render either powerplant near-silent under most loads. Around town the Escape is quiet as a vault, on the highway only wind noise intrudes into the cabin. 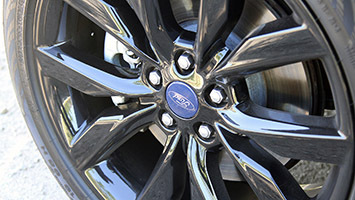 Ford made just one suspension change, at the rear, to improve compliance over sharp bumps: the monotube shocks are ten millimeters wider, and the springs are now linear instead of progressive. 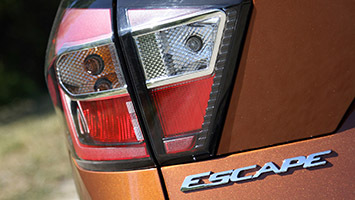 The Escape's handling has earned good marks for years, and the 2017 holds the line in that department. The Escape will happily – and quietly – eat up urban commuting miles. 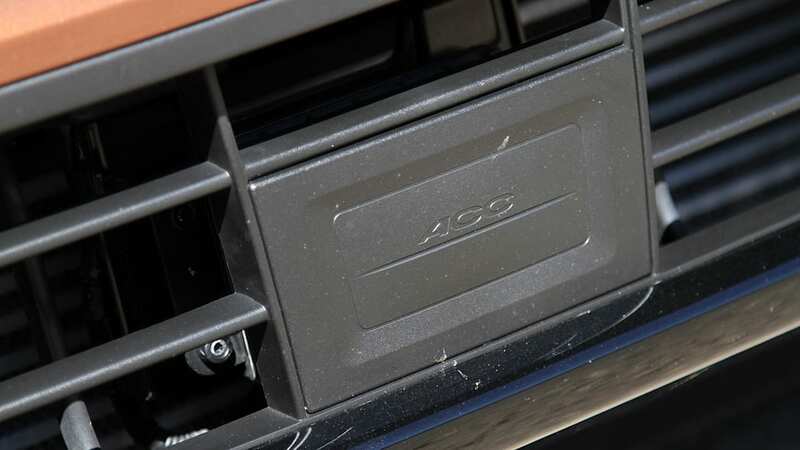 The stop-start system disengages and re-engages with surprising subtlety and no driveline vibrations, thanks to enhanced starter-motor logic. Confident steering on-center and resilient suspension tuning insulate the driver from the relentless low-frequency jostling that induces fatigue during lengthy highway stints. The Escape is prepared to do so much more than that dynamically, though. 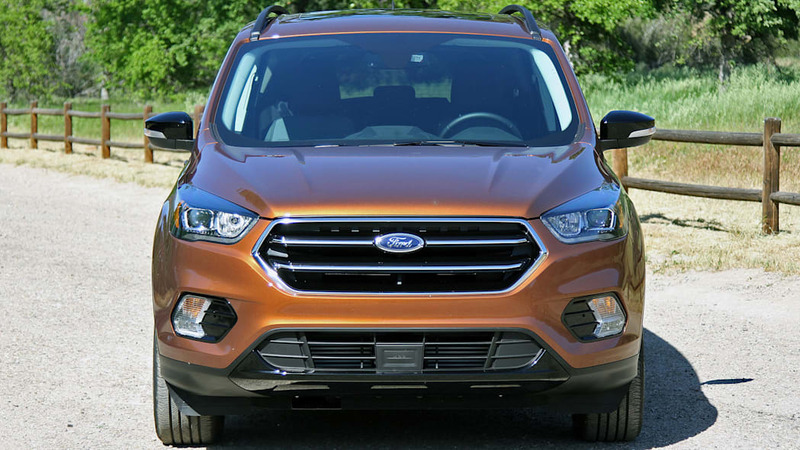 The compact hauler shares a platform with the Ford Focus, and although it is larger and heavier than its sedan and hatch counterparts, the handling DNA of the Escape's source material is evident in every switchback turn and sweeper. 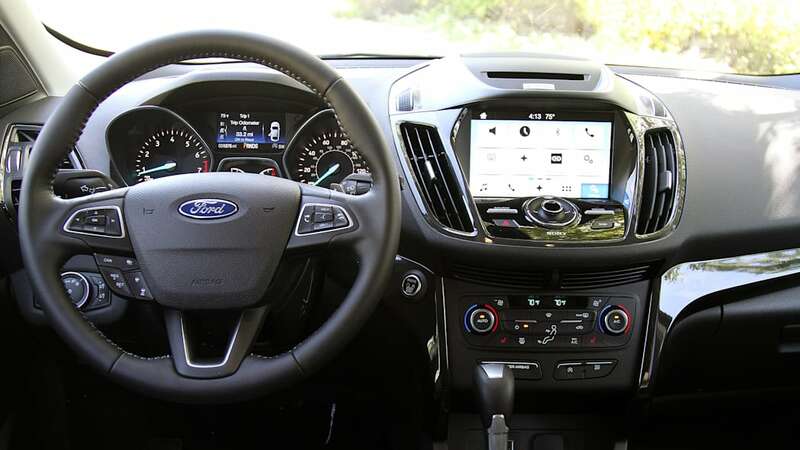 The steering is less communicative in the Escape than the Focus, unsurprisingly, but adept suspension tuning translates into confident shifts in body weight on entry into turns and disciplined behavior throughout a bend, even over poor surfacing mid-corner. 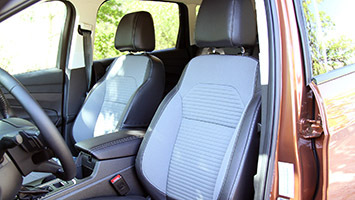 Speaking of which, the cloth seats are the prime choice for spirited driving – the friction of the cloth holds the driver. 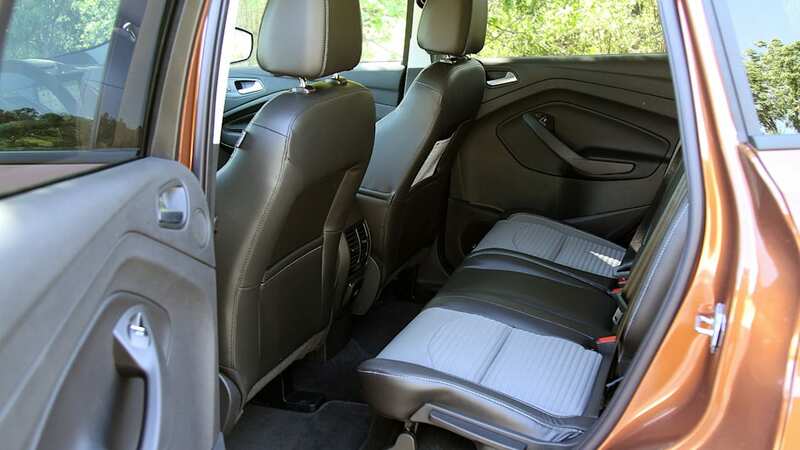 The inadequate seat bolsters aren't up to the level of the Escape's handling, though. A price drop on 2017 models signals Ford's motivation to get back to the compact-crossover sales lead. The 2017 SE FWD starts at $25,995, a $695 price drop from 2016. The Titanium FWD starts at $29,995, an $895 decrease. Only the $24,495 entry-level S costs more than before, by $500. The Escape gathers a nicer interior, a quieter ride, more powerful engines and more engine options, and rewarding handling into a package that costs less than before. Scanning the primary competition, the Toyota RAV4 offers no counterpart to features like Enhanced Park Assist or the driver attention alert. The Honda CR-V lacks those as well. 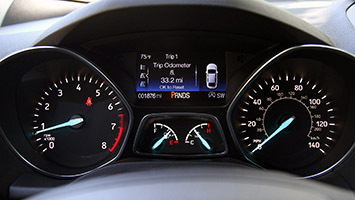 Neither Japanese crossover has an answer to SYNC Connect or the FordPass app, and neither can match the Escape's handling. 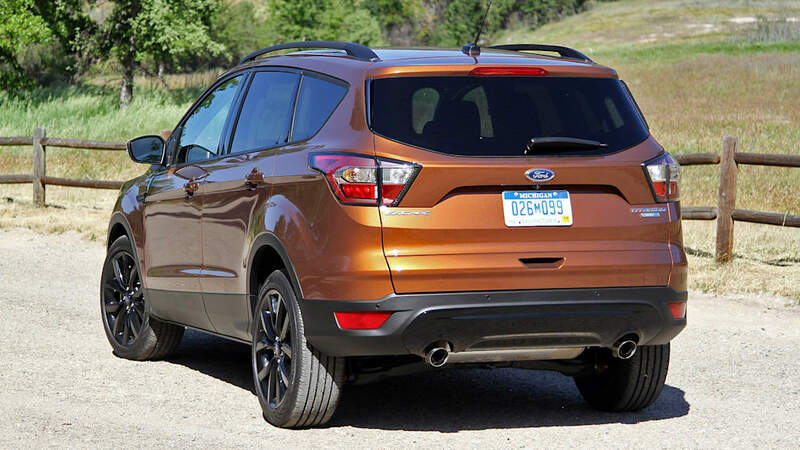 Plus, the Escape's price drop slots it just under the MSRPs of comparable RAV4 and CR-V trims. The 2017 Ford Escape is a big improvement on what was an already remarkable crossover, and the customer-focused changes pay dividends to the Escape faithful. 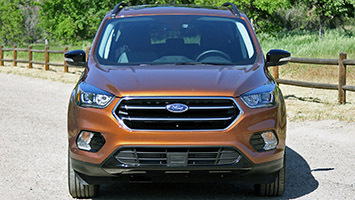 We can't predict if the upgrades and equipment differentiators will be enough for Ford's compact entry to claw back the sales deficit to the RAV4 and CR-V (the Toyota outsold the Ford by about 9,000 units in 2015, the Honda moved about 39,000 more units), but the new Escape is an excellent weapon to begin the fight back to the top.